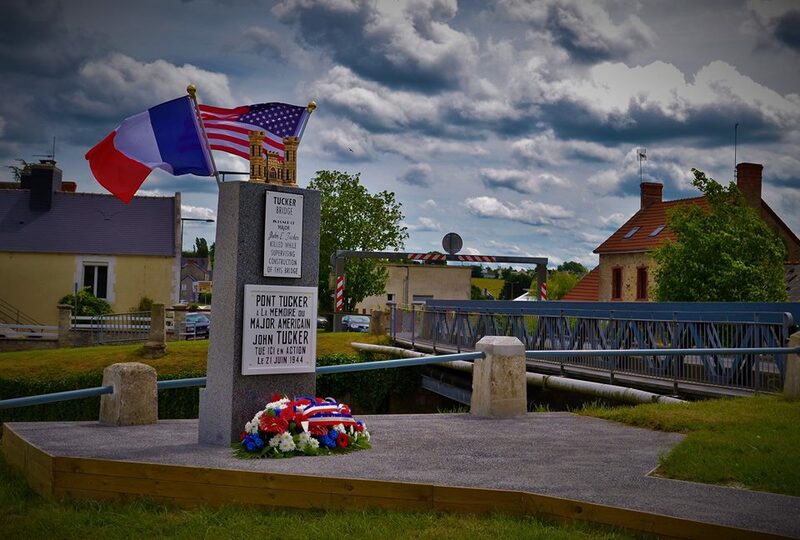 On Monday, June 5th, 2017, more than 300 people gathered to inaugurate the new stele in honor of Major John E. Tucker on the bridge between Carentan and Saint-Hilaire-Petitville. In order to unveil this block of granite where are reproductions of the 1944’s steles and emblem of the American corps of engineers, many civil and military authorities have made the displacement. Among them: Mister Lhonneur, Mayor and President of the community of communes of Carentan-les-Marais; Mr. Fauny, Mayor of Saint-Hilaire-Petitville; George K. Mullins, veteran of the 101st Airborne Division, General Glenn Goddard, elected officials, orchestra, US Army with color guard … A ceremony punctuated with moving speeches at the height of the event. It was in 2016 that Bertrand Froger launched a call from his Facebook page (Normandy 1944, Follow the Guide! ), Affected by the disappearance of the stelae in homage to Major Tucker killed in action in June 1944. They had been implanted following his death by his men of the 300th Engineer Combat Battalion and citizens of the area. The project is taking shape, supported by the two municipalities, and then a participatory fundraising campaign is launched. Hundreds of people relay this action, dozens contribute, individuals and associations. The objective is achieved and the funds raised. On June 5th, 2017, Major Tucker’s honor is safe and his memory preserved and honored.